I’m getting old, my mom won’t like to read it but it’s true. I will be 23 by mid September. I started a big girl job. I’ve been eating salad. You know, adult things. 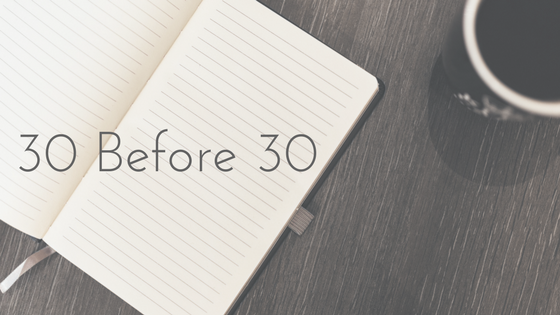 So 30 is just under 7 and a half years away and there’s a lot I would like to do between now and then so I thought I would share my 30 things before 30 list! See at least 30 states. Get paid for a freelance gig. Develop a healthy diet and regular exercise routine. Curate a collection of my own recipes. Take three random classes just because. Take a vacation just to relax. Visit somewhere new for at least a month. Make time for vacation every year. Create a budget and stick to it, allowing it to fluctuate as finances change. Learn how to let go of material items. Strive to spend majority of time with enjoyable tasks. Take a real picture everyday for a year. Take 20 minutes once a week to do nothing. Face a fear every year. Figure out how to use the Super 8 camera. Have a real “Treat Yo’ Self” day every year, but save for it. Make a positive impact on someone’s life. What do you want to do before you turn 30?